Kremlin expresses hope Greece will come to a compromise with it creditors after shock 'no' vote in austerity referendum. Russian president Vladimir Putin discussed the results in a telephone call July 6 with Greek Prime Minister Alexis Tsipras. Moscow respects the choice made by the people of Greece and hopes that its Greek partners “will reach the necessary compromise with creditors as soon as possible” in order to take decisions “that would best contribute to economic and social stability in that country”, Kremlin press secretary Dmitry Peskov has said. “Greece is a country with which we have long-standing, historically close relations and a multidimensional partnership. We respect the referendum vote. It goes without saying that we are closely watching what happened, is happening and, most importantly, will be happening in Greece,” Peskov said. The Kremlin press service added that President Vladimir Putin and Greek Prime Minister Alexis Tsipras had talked by phone July 6, the day after the shock 'no' vote in the country's referendum on the EU economic rescue plan. They discussed the outcomes of the referendum as well as “some issues of further developing Russian-Greek cooperation”. Putin had expressed support for the people of Greece in overcoming the difficulties facing the country. Asked whether Russia could provide financial aid to Greece if no agreement with the creditors was reached, Peskov said that this question should be addressed to Athens. “We have said more than once and Foreign Minister [Sergey] Lavrov has said, that so far there have been no requests for help and this issue has not featured in our bilateral contacts,” he said. In July 5 referendum, over 61 percent of Greeks voted against the bailout plan proposed by European creditors, with some 39 percent voting for it. The turnout was 62.5 percent, or about 6.2 million people. The referendum was initiated by Alexis Tsipras’s government, which said that popular support would help the country’s authorities to reach an agreement with the creditors sooner and on terms more acceptable for Athens. 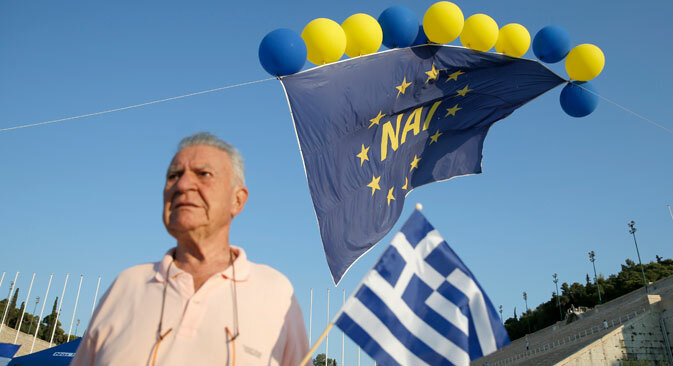 EU officials representing the creditors urged the Greek government not to hold the referendum, fearing that a “no” vote could precipitate the country’s exit from the Eurozone. At the same time, according to the head of the State Duma’s International Affairs Committee, Alexey Pushkov, the short-term probability of Athens leaving the Eurozone is small. Speaking in an interview for the Rossiya 24 news channel, he said that the referendum was not about leaving the Eurozone but about people’s attitude to the terms of the bailout plan. A Greek exit from the Eurozone was currently not on the agenda - although it could come up in the near future - the MP added. Pushkov said that neither Athens nor Brussels was interested in Greece dropping the euro. This could create a domino effect and have a negative impact on both the Eurozone and the EU project as a whole. Earlier, Pushkov told Russian state news agency TASS that currently there were two ways the situation could go. Greece may resume talks with the European Union and its creditors “in order to secure somewhat better terms and at least partially revise the deal that Europe is offering to Greece”. Or, “the European Union refuses to hold talks or adopts an intransigent position, which does not allow for the slightest compromise, in order to create a political crisis in Greece and bring Tsipras’ government down”. Whether Greece remains in the Eurozone will depend on which of these scenarios is implemented, Pushkov said.